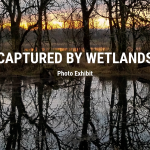 Thank you to all who participated in our National Wetlands Month photo contest. We are overwhelmed with the beauty, humor and obvious love you have for your wetlands. Keep exploring and we encourage you to send us your photos through our social media channels throughout the year! Sharky’s Woodfired Mexican Grill Opening and Supporting TWC on May 15th!